I've been watching this fence fall into decrepitude since a night about ten years ago when I jumped over it to hide from a carload of drunken teenagers. The middle section was intact then, and I felt my feet brush the top as I sailed over. "My God," I thought. "A quarter-inch higher and I'd have broken my neck." Although I live in a semi-rural neighborhood, Danbury is a town of about 80,000 with another 3 million within 30 miles. We're an hour from Manhattan. You never know who might be driving through—particularly at midnight, the hour when I used to walk. In this case, the intruders were a posse of teens taunting me from the windows of a car with a bad muffler and New York plates. They had already passed me twice, and I heard the rumble approaching again. In those years I carried pepper spray but no gun. Instead of risking a face-off, I decided to run. I watched the car zoom by moments after I ducked behind the sugar maple at left, and that was the last I saw of it. 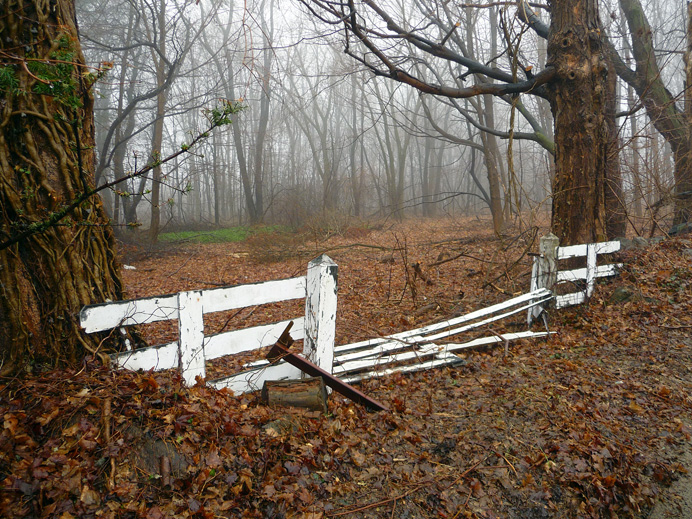 The land behind the fence, today steeped in fog and rain, was probably pasture when this fence was built. Notice how all the trees in the background appear to be of similar age? If you cut one down and counted the rings, you could probably pinpoint the year when the last horse or cow grazed here. My guess is about 1965. Why does the fence stop at right? Because, except where they needed a passage for livestock or equipment, farmers in this region built their fences of stone. There was plenty of it: At the end of the last ice age, 21,000 years ago, retreating glaciers dropped millions of tons of rock that they had dredged out of Canada on their way south. Buried under the soil, the rocks rose a few millimeters every winter as the water that seeped under them froze and expanded—until one day they snagged the farmer's plow. Carted to the margins by a dozen generations of field hands, the rocks have built fences that in some places today are waist-high and wide as a wagon.